In an area of Jaffa where people of differing faiths co-exist, a number of stories unfold and gradually interweave: 13-year-old Nasri and his older brother Omar live in fear when their entire family is left in danger after their uncle foolishly wounds a prominent clan member; naive young Palestinian refugee Malek works illegally in Israel to help finance the surgery that will save his mother's life; affluent Palestinian Binj dreams of a bright future with his Jewish girlfriend; and Jewish policeman Dando becomes obsessed with revenge when his brother is found dead in the West Bank. Ajami is a compelling, multi-stranded and Oscar nominated debut feature from Israeli directors Scandar Copti and Yaron Shaniu, Ajami has been favourably compared to Alejandro González Iñárritu's Amores Perros, and won a number of Israeli Film Academy awards, including Best Film, Best Screenplay and Best Director. 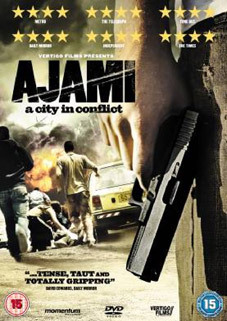 Described by Entertainment Weekly as "Like an Israeli Amores Perros crossed with City of God," Ajami will be released on UK DVD on 14th February 2011 (although retailers are listing 31st January as the release date) by Momentum Pictures at the RRP of £12.99. No extras are expected.